BioBase4SME Innovation Biocamp 2017 trained and inspired 17 enthusiastic, biobased start-ups and SMEs. Twenty participants from seventeen selected North-West European start-ups and young SMEs gathered in Yorkshire (UK) from 23-28th July 2017 for the first BioBase4SME Innovation Biocamp. The Innovation Biocamp, a fully funded intensive, week-long training course aims to provide high-potential biobased companies with hands-on tools needed to commercialise their biobased ideas and grow their companies. The Innovation Biocamp, co-financed by Europe’s Interreg NWE programme, is planning a second edition in 2018. The Innovation Biocamp included a series of lectures from experts in key aspects of business growth, such as value propositions, business modelling, financing growth and risk management. Each lecture was followed by group exercises mediated by an experienced facilitator. Participants then worked with mentors to apply this learning to their own company. The training culminated in live pitches to a panel of specialist investors. Participant also benefited from peer-to-peer learning and networking with biobased companies across North-West Europe. 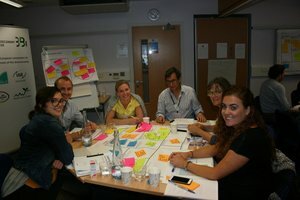 The format of the Innovation Biocamp was integral to its success. The input from trainers and facilitators, subject matters experts, industry experts and mentors made for a winning combination. The trainers and facilitators worked together to troubleshoot issues and the whole team’s responsiveness to feedback was seen very positively by delegates. The variety of styles of delivery and range of activities provided all delegates with different opportunities to learn, share and connect. The Innovation BioCamp 2017 was evaluated as a very positive experience by the participants. Many of them said it exceeded their expectations and many of them felt re-invigorated and ready to refocus on their business in a more strategic way. Importantly everyone felt that they would be able to use what they learned and every delegate said it was well worth taking time away from day-to-day business to attend. In terms of BioBase4SME hopes and expectations, the vision created by Margaret Smallwood and the team at Biovale has certainly been achieved. This was a well-received first BioCamp and an excellent base to reflect on and look at how it can be made even better for the 2018 edition. For more information on the BioBase4SME Innovation Biocamp 2018, please contact Tanja.Meyer@bbeu.org.